San Diego Home Sales website search offers all Ocean Beach homes, condos and foreclosures for sale. You are able to get new property listings daily that meet your search criteria. As its name suggests, Ocean Beach is an oceanfront community of the city of San Diego, located about eight miles north of downtown on the northern part of a peninsula jutting out into the Pacific Ocean. Ocean Beach is situated south of Mission Bay and Mission Beach, north of Point Loma and northwest of downtown. The community was given its name in 1887 by two developers who started a real estate firm in order to develop the community, building the Cliff House resort and hotel and subdividing the area into a number of different lots. But the development didn't take off, and it didn't begin to develop again until later in the 20th century. The community wasn't easily linked to the rest of San Diego until 1967, when Interstate-8 was constructed. 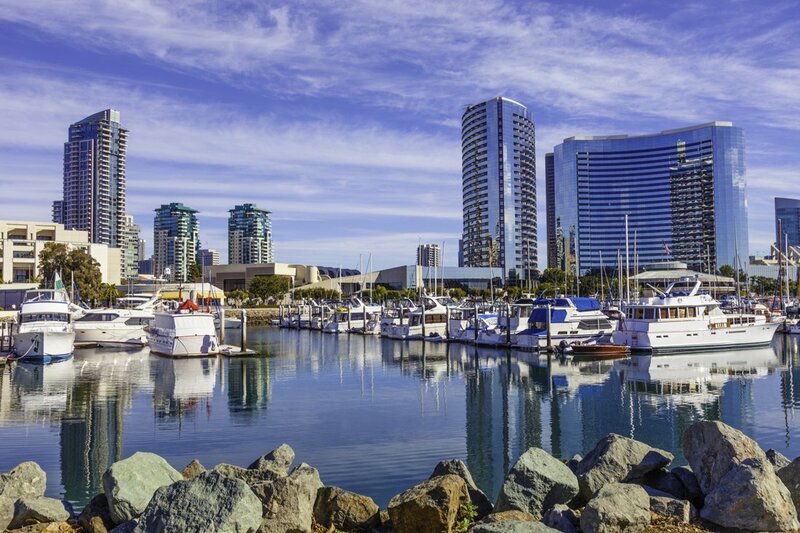 The community is just minutes from the San Diego International Airport as well as from various Navy and other military installations. It's just south of Mission Bay Park, which is the largest man-made water park in the country at more than 4,000 acres and includes San Diego Sea World, with 27 miles of shoreline. It also has its own oceanfront park in the Ocean Beach Athletic Arena and Robb Field. Other entertainment venues include Ocean Beach Recreation Center and Dusty Rhodes Park. Annual events held in Ocean Beach include the Ocean Beach Street Fair and Chili Cookoff in June, a jazz festival in September, the Ocean Beach Christmas Parade in December and the Ocean Beach Kite Festival in March. Every week on Wednesday, two blocks of Newport Avenue are closed to vehicular traffic for a weekly farmers market. Constructed in 1966, the Ocean Beach Municipal Pier, which features a restaurant and a bait shop, is the longest concrete pier on the West Coast. In addition, most of the mile-long beach in Ocean Beach has a concrete walkway running its length, making for a nice path for running or taking oceanfront sunset walks. 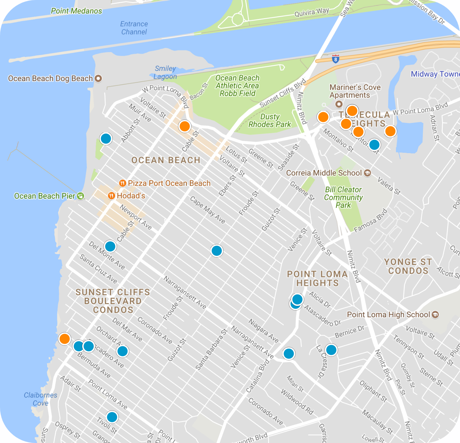 The community's commercial activity is centered around Newport Avenue, which has a number of antique shops, restaurants, cafes, bar, surfing shops, an international youth hostel and specialty and gift stores. Three school serve the Ocean Beach youth community: Ocean Beach Elementary, a public school serving grades kindergarten through fourth grade, Sacred Heart Academy, a Catholic kindergarten through eighth grade school, and Warren-Walker, a private kindergarten through eighth grade school. The community also has its own post office, a public library and a vegetarian co-op.